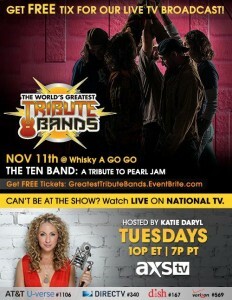 The Worlds Greatest Tribute Bands: THE TEN BAND (Pearl Jam Tribute Band) Performs At West Hollywood’s Whisky A Go-Go! The Worlds Greatest Tribute Bands show continued this week at the West Hollywood venue, Whisky A Go-Go. 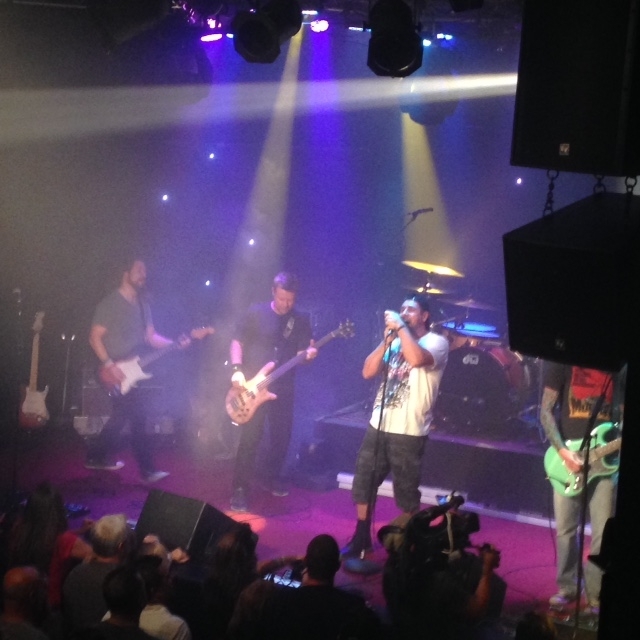 This Tuesday night, it was all about the 90’s, with a performance by the fantastic Pearl Jam tribute band, The Ten Band. This event is hosted by Katie Daryl who, along with AXS TV, organizes the event. The Ten Band have certainly done their homework and know Pearl Jam classics frontwards and backwards. Formed in 2003, they are regarded as the longest touring PJ Tribute in the world! On lead vocals is Nick Rhodes and his voice sounded so much like Eddie Vedder that you would have thought Eddie was really on stage! They played hits like “Evenflow”, “Jeremy” and “Alive” from their iconic debut album, Ten. The Ten Band seemed to almost play the music as Pearl Jam would have performed them live with additional lyrics and instrumentation. The crowd was also excited to hear them play “Betterman” from their Vitalogy album. “Given to Fly” from their album, Yield, was another crowd favorite as it often gets lost in their vast catalogue of music. They wrapped up the evening with “Yellow Ledbetter” from their album, Lost Dogs which Pearl Jam fans know is a live show must. The band repeatedly expressed their gratitude to be in LA playing at such a historic venue. Their energetic and enthusiasm on stage resonated with the audience and will surely not be forgotten. 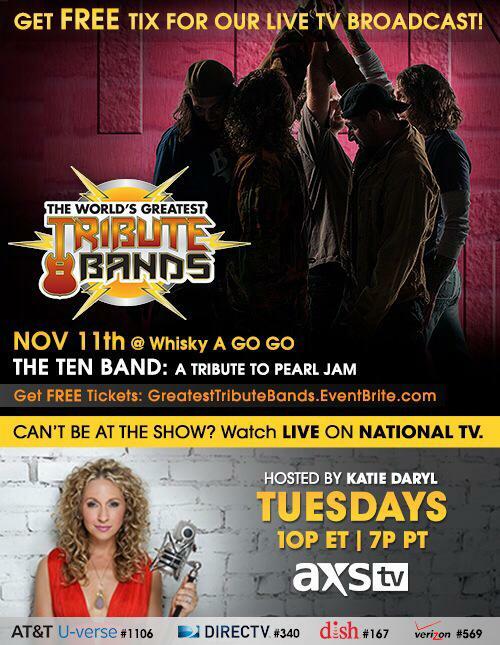 For the true Pearl Jam fan, The Ten Band is a must see! Thanks for doing this interview guys! Where does this interview find you today? TK: Absolutely! Thanks for having us. Today we are in our hometown of Pittsburgh, PA just doing our thing tending to day jobs and family. What does it mean to you all to be apart of the Worlds Greatest Tribute Bands series? TK: We are deeply humbled, and completely psyched to represent our hometown and all of our fellow Pearl Jam fans worldwide on AXS TV! It’s been a great experience working with Katie Daryl and the crew and we can’t wait to get out to LA! Can you remember the moment that you decided you wanted to form this band? Why Pearl Jam exactly? TK: We are all products of the 90’s. Brian and I spent most of the early 90’s writing original music influenced by a lot of what was happening at that time… I can fondly recall the first listening of Pearl Jam’s Ten album and thinking, “Wow, this marks a change in what is happening.” After life took us in some different directions in the late 90’s, we decided it was time to get back together and play music. It was the early 2000’s by then and we all had different life commitments and really were just looking for an outlet to perform. At that time tribute bands were becoming very popular in various venues. 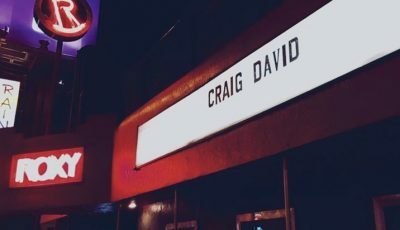 With ticket prices on the rise and various industry pressures going on, many venues found it profitable to have tributes perform between the national acts that came through town. We had some friends performing in various local tributes to Van Halen, Ozzy Osbourne, The Rolling Stones and whatnot. We really had no idea all of that was going on nationally at the time and we just figured if we were gonna play covers or perform as an actual tribute band. The only band that made sense for us had to be Pearl Jam. We really had no idea if anyone would be into it or show up, but we figured we’d give it a shot in our hometown and see what happened. At the first show in Pittsburgh it become very obvious that we were not the only ones who loved this music! We were blown away by all of the folks who came out and had a total blast jumping up and down and singing along to the show. After a year or so and a few lineup changes Nick found us on the web. He was performing with various Pearl Jam tributes in NYC. We became friends, played a few shows with him flying in and then in 2005 he moved to Pittsburgh to join The Ten Band full time. At the time we were playing a few local shows and some regional stuff. We had made a few road trips up and down the east coast and made a couple of pro videos, posted them on YouTube and things kind of exploded. Suddenly we were receiving offers to go all over the country. So we have basically spent the last 10 years or so traveling around the country meeting our fellow Pearl Jam fans and having an amazing time! TK: For us it was easy: Ten was the album which essentially started it all for Pearl Jam and it was our first love. 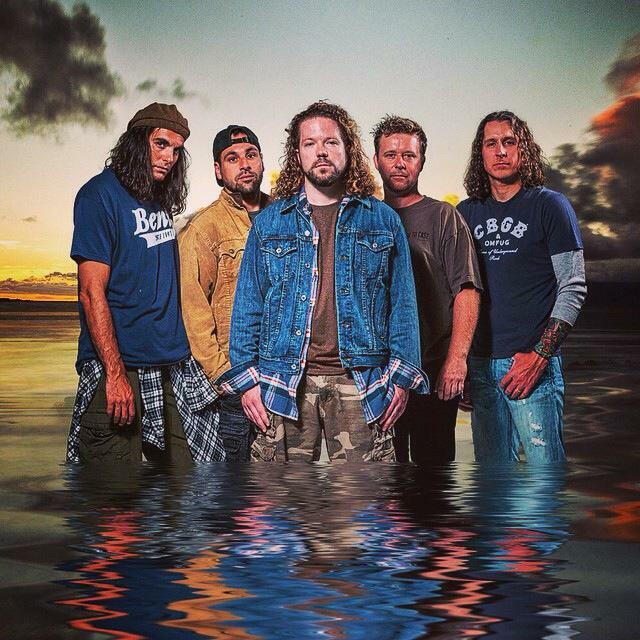 We originally called the band simply Ten… A Tribute to Pearl Jam. 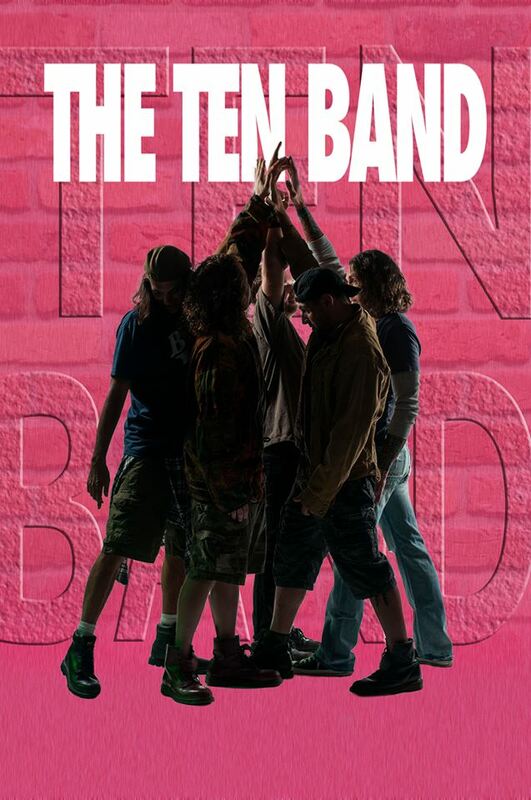 Over the years our friends and other Pearl Jam fans began to call us “The Ten Band”. 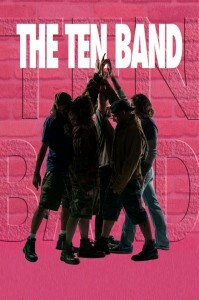 Perhaps it was a reference to The Ten Club (the official Pearl Jam fan club) or to our domain name tenband.com. Not sure really, but it has kinda stuck, so we have gone with “The Ten Band” in recent years. How did it feel the first time Pearl Jam thanked you and commended the band? TK: Well… we have never “officially” met the band in person. We do have a great relationship with the various Pearl Jam charities such as wishlistfoundation.org and other fan groups which support the band. There has been some mention of all of the tributes and the work we do to support the charities in the fan club publications in the past but that’s all so far. Our only personal connection is through the local Pittsburgh sports players who are also Pearl Jam fans and friends of The Ten Band. We also have made a few other celebrity connections at shows in NYC and other large cities. A few of them are personal friends of the guys in Pearl Jam and have passed our thanks along. The PJ guys are big sports fans and we are from a big sports town with a ton of famous Pearl Jam Fans who are also friends of The Ten Band so that’s the primary connection I guess, ha! Our mutual #21 Roberto Clemente love is perhaps our first degree of separation! That must be pretty cool to have played at Pearl Jam concert pre-parties! What have those been like? TK: One of the most pleasant surprises of immersing ourselves into the Pearl Jam Fan community has been meeting all of the amazing people who support the band from a philanthropical perspective. 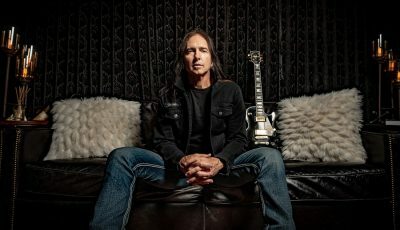 Organizations like wishlistfoundation.org among others support the band by various means and in particular via pre-show parties prior to every Pearl Jam concert in the US and around the globe. The tireless efforts of folks like Laura Trafton, Katrina Coker and Melissa Waldron among many others to combine their love for Pearl Jam with a passion to make a difference in the world are simply amazing and inspiring. We have been honored to help with some of these events to set the mood and to give back to those who have been supportive to not only Pearl Jam but the world at large. We do our very best to donate our time to these events whenever possible. Some highlights have included events prior to Pearl Jam concerts in Pittsburgh at PNC Park with the Rolling Stones and at Mellon Arena and Consol Energy Center. These experiences have been simply amazing and provide some of the many experiences that inspire us to continue to do what we do! Pearl Jam as well as the fans who support them are truly a special group of people and we are thrilled to be among them! During your shows, do you take it one step further and try to act and dress like the members of Pearl Jam? That in itself is an amazing compliment that we truly take to heart. For those who have experienced a Live Pearl Jam show, that is a HUGE statement and we do not take that lightly. It’s all about the amazing music first and fore-most. All that said, for the AXS TV show we plan to bring about a bit of nostalgia with an era specific representation of our beloved “Grunge Fashion.” We are products of the times after all and we cannot wait to see Katie’s grunge rock inspired dress that night! It will be a totally fun time for fans of the era (I for one proudly still wear my Doc Martens daily anyway)! How do you think the group has developed over the years? TK: Wow. Well it has been an amazing ride. We’ve met so many amazing people along the way and had the opportunity share our common love for Pearl Jam with so many cool people. 10+ years, over 500 shows, it’s hard to look back and not say “wow.” We have had some lineup changes over the years with Nick, Brian and myself being the remaining original members. Some amazing musicians and some great friendships formed with those folks and our fellow PJ fans. It’s truly like a family! I wouldn’t trade the experience for the world. We remain committed to entertaining both the die-hard and casual fans alike and trying to make a difference through Pearl Jam charities along the way. Thus far, what’s a favorite memory or something funny that’s taken place with the band (in-studio, onstage, or elsewhere)? TK: Ha! Well if you put five or six guys in a van driving insane numbers of hours around the country, there are bound to be some hilarious stories that emerge, more than I can even share. But some of my most favorite memories are those that have been shared by the folks we have met along the way. An example of one of my favorites: In Cincinnati, Ohio one night, we noticed one very enthusiastic Pearl Jam fan dancing around and singing at the top of his lungs throughout the evening, culminating in a very emotional display during the performance of “Alive” toward the end of the show. At the end of the evening, I introduced myself to the guy and he took a few moments to share his story. He showed me a 19 inch scar on his chest from throat to gut which he suggested came from open heart surgery a few years prior. He also described a very challenging life that led to his arrival in the operating room that night including his heart literally stopping on the table. He told me a story about relating to “Alive” that night and what it meant to him. It occurred to me that night that despite the actual ‘intended meaning’ of that particular song, each person finds some place of inspiration within the interpretation of the lyric. That is especially true of the lyrics of Eddie Vedder. So many people find a form of strength and/or inspiration from their own personal interpretation of this music. For us to provide any representation of that to folks is something that I will always treasure. In fact if I ever get the opportunity to thank the band for something, that will be it. Period. No question about it. I have literally tens or perhaps a hundred of similar stories to share. Anything that you would like Pearl Jam fans to know about you guys? TK: Wow. Well, first and foremost we would like our fellow fans of Pearl Jam to know that we are nothing more than the result of the same passion that we all have for the band, the music, and the experience. There are no rock stars in a tribute band, rather just fans themselves. Fans of Pearl Jam are an amazing bunch committed to not only a love for the band itself, but in fact the world at large. We are thrilled to share a small part in that. We can’t wait to share that in LA on November 11th and we look forward to throwing one hell of a party with you all at the Whisky a Go-Go that night! All are welcome. Please join us! Getting “Complètement fou” aka “Completely Crazy” with Julie Budet of French Electro-Pop Band, YELLE! 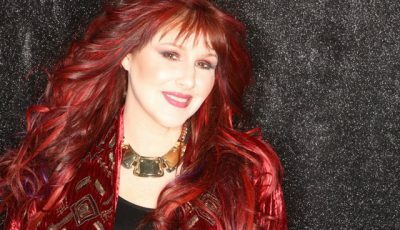 80’s Pop Star TIFFANY Entertains LA’s WHISKEY A GO GO!